← Falling in love with solids. . . So, I bought this fabric over a year ago. A friend was having a baby girl and I wanted to make her something. That was before my quilting days where I usually just made blankets with a minky backing, bibs, burps, and a ball.Very cute, but, not a quilt. 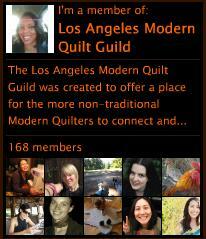 So, when I started quilting earlier this year – I quickly switched it to a quilting project. I had been eying circle quilts ever since my first quilt and I knew that I would try it on a baby quilt since it would be smaller and more manageable. 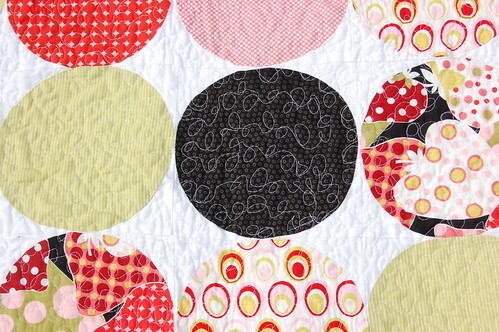 And since I love circles I started researching how to piece and applique them. I was intrigued with the Dale Fleming six minute circle method and knew this would be one of the first I would try. It turned out to be pretty simple but longer than I wanted it to be. I had 48 circles so if it was really six minutes per circle that equals almost five hours not including any of the prep work. Anyway, I was happy with how it turned out. The quilt is designed around the Alexander Henry “Very Berry” fabric and a couple of other coordinating Alexander Henry prints. Then I picked up a couple of coordinating fabrics from Joann’s – the black and the pink to complete the look. I am starting to realize that I like black in quilts. I guess I like the contrast. Plus the black print circles really drew out the black background in the “Very Berry” fabric and pulled the quilt together. I quilted it in what I call a Loop de Loop pattern – don’t know what the official name is. It was fun and easy to do. I’ll definitely get better with this quilting thing over time. . . 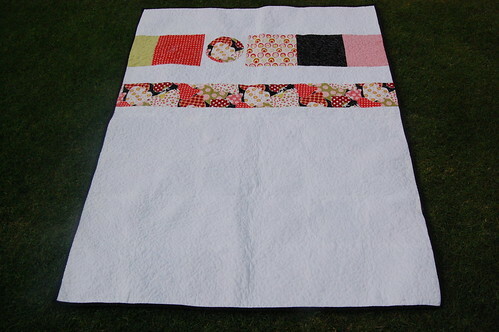 The back is simple highlighting the “Very Berry” fabric with a strip going across the width of the quilt and another strip of the coordinating fabrics pieced with a circle in “Very Berry” thrown in. 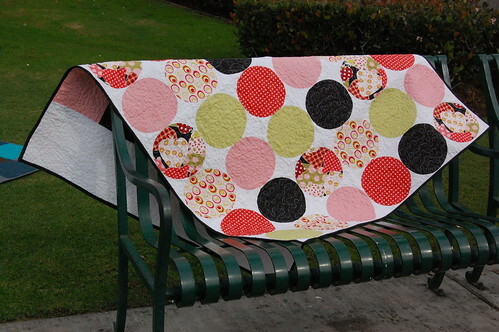 I wanted the circles in the quilt to be very close together like the Michael Miller Disco Dot fabric – so of course the name of the quilt is Strawberry Disco Fields! I like the circular patterns. Thanks! So glad you like them! 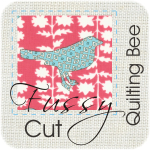 I just stumbled on your blog through Sew Mama Sew and I love your work! This quilt is awesome! Thanks so much Missie! So glad that you love it! oh my! I am in love with this quilt! One day I will get brave enough to try circles! Thanks Sonia! Circles are actually easier than you think. 🙂 They are a bit time consuming but, pretty easy if you use the Dale Flemming method linked in my post. When you get brave enough to try let me know if you have any questions! Ooh I love that quilt! The colors are beautiful and oh so cheery! I will have to check out that tutorial for the 6-minute circle. Great job!